Fast approaching 80, Ebrahim Alkazi, the grand old man variously—and sometimes simultaneously—of Indian theatre, arts and films, is returning to his first love. His Alkazi Foundation for Arts, a unique archive centre that's coming up in Delhi, would bring together his vast collection of Indian art and period photographs that are scattered around his various homes and centres across the world. At four every afternoon whenever he is in Delhi—and that is quite frequently these days—he drops everything he's doing and drives to a nursing home to visit his ailing wife, Roshan. They separated almost 50 years ago when Alkazi took up with a filmmaker's ex-wife but the couple only seems to have grown closer over the years. "I fell in love with her when I saw her for the first time in her brother Sultan Padamsee's play, Salome, where she did the dance of the seven veils," Alkazi recalls fondly. Actually, he fell in love with the whole Padamsee family, especially Sultan, who died, shooting himself in the head when he was only 23. "Sultan was so brilliant that even his professors were in awe of him. He was the Orson Welles of India, demanding the highest standards, his theatre productions an orchestration of colour, music and light." It was Sultan who seduced him away from painting into theatre. "You can't do everything," he says dismissively about those early years as a painter. "Besides, painting is so two-dimensional compared to the theatre, which is a living art where everything, the sets, actors, script, movement all comes together," says Alkazi, who once brought B.K. Iyengar, then an unknown teacher from Pune, to teach his actors yoga. "It was wonderful, all that joyfulness and dedication, wanting to achieve the highest standards." All his friends in the art world—Vasudev Gaitonde, M.F. Husain, Tyeb Mehta, Akbar Padamsee—wanted to share in this exciting new world, pitching in by painting sets for his productions. And when he moved to Delhi, as director of the NSD where he served famously for 15 years, "many artists moved with me". It was this "long, affectionate connection" with the artists that was the seed of his priceless art collection, arguably the largest private collection of Indian art anywhere in the world. Alkazi insists it wasn't greed that drove him to start his collection, but a genuine desire to help out his artist friends. "There were so few art buyers in those days, most artists couldn't even afford to rent gallery space for exhibitions." As the son of a rich Arab trader who had settled down with his large family (nine children) in a mansion in Pune, Alkazi decided to play patron. He rented gallery space for the struggling artists. And when he noticed that Tyeb was always sidelined at these exhibitions ("there was so much politics, the resentment and jealousy among the artists was unbelievable"), Alkazi rented an entire gallery wing for Tyeb's first exhibition. The artists repaid him in kind, not only painting his sets for free but gifting him their drawings and paintings. Again when F.N. Souza, after a brilliant debut in London, migrated to the US and fell on hard times, it was Alkazi who came to the rescue. He was not the first—that role fell to an American collector who paid Souza 500 dollars a month to produce paintings for him. "But Souza sent him all rubbish," recalls Alkazi, who prides himself on his fine, discerning eye for art. 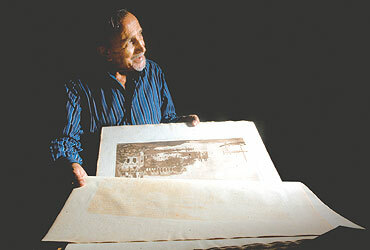 When relations between the artist and his American patron strained, Alkazi stepped in, agreeing to buy Souza's paintings. It wasn't easy for Souza to dupe his new patron. "I knew what I wanted," says Alkazi, "I wouldn't settle for anything less." He insists that his wish to help Souza was disinterested. When he found, for instance, that Souza's paintings and drawings were heaped up in his small studio in an untidy mess, Alkazi's fastidious love of order prevailed and he volunteered his services. For three months, Alkazi says, he went daily to Souza's studio, labelling each drawing, neatly documenting them, until Souza turned around one day and told his patron: "Hey! I should charge you for this (handling his paintings)." He was that sort of man, Alkazi recalls, "with a vicious streak, biting the hand that fed him." But ask him the value of his collection and Alkazi winces with all the fine sensitivity of Old Money faced with the vulgarity of the marketplace. "It's a fake market now, fuelled by all these nris who now have money and want to buy culture." Is that why he's turned to photographs? He's indignant: his current interest that's taking up all his time—meticulously documenting and filing away album after invaluable album in air-conditioned steel vaults installed at the foundation—goes a long way back. It was Roshan, as a costume designer who worked on all his productions, who introduced him to what has now become an abiding passion: period pre-Mutiny paintings and photographs of the post-Mutiny Raj. During their days at the Royal Academy of Dramatic Arts in London, their research of period costumes led them to the India Office Library. His weekend browsings there roused the historian and educator in Alkazi. He funded a series of publications out of the library's treasure trove of company paintings and photographs. "There's all this history, a different view of India from the British government's. All this and you don't study it," he says flicking through the pages of a book of reproductions of 19th-century paintings by the Fraser brothers, who commissioned artists to paint vignettes of local life and people for their personal album. "I wanted to inspire our own artists," he says of his early publishing venture that didn't quite take off. "But at least they are there," instead of lying unknown and unseen in a London library. The collector in him was roused too. With photography having reached India less than a year after it was invented in 1839, and nearly every Briton—visitor or resident—returning home from India with a personal album or two, Alkazi could finally start a collection that was endless. His first forays were to Portabello Road, where he found people selling old photos from barrows in the flea market. But the stall-owners proved well-informed and well-stocked. "You could ask them for anything, British uniforms of a particular regiment, for example, and they'd come up with it." Slowly, he got the hang of it. "You develop an eye for the unusual, pick up something that serves your purpose or rounds off a collection." Slowly, he began to acquire a reputation among dealers as this bloke who specialised in India photographs. They brought him anything that may interest him. Brought him entire albums before dismantling them to sell as individual photographs. On the other hand, he found London's auction houses "very intimidating, I did not even know how to bid". He's come a long way since then, thanks to his passion to acquire old albums intact, before they are dismantled by dealers. The personal album of a Kanpur civil surgeon, John Tressider, for example. He wanted it, he says, because he was drawn to the amateur photographer, a Mutiny survivor, who documented the people around him, both his British friends and Indian "acquaintances". There was fierce bidding for that album, but it was Alkazi who won it. The English aristocracy, he avers, "are too kanjoos (miserly). They have neither the money nor the nerve for this. But they have a long tradition of collecting, they have the finesse to preserve their collections". So, why does he want to bring home his collection, over 80,000 rare photographs in all, now lying scattered in his two centres in London and New York, back here to India? That too, even while "people think I'm mad when I expect them to handle my collections with care", where he dreads being chased by publishers who want to publish coffee-tablers "of pretty pictures without context", and friends who will want to gape at his pictures wondering how much they cost. Because, says Alkazi, "these photos were never meant to lie in boxes". He wants to throw open his collection to select scholars, to open a private research institution that offers its priceless archives that is unlike any other in the country. His foundation also plans to publish books, not mere coffee-tablers but scholarly books that put the photographs in their right context. The first of the series, Lucknow: City of Illusion, is already out, showcasing the photographs of Felice Beato, "the grandfather of war photography." There's another reason why Alkazi is hurrying to bring his vast collection home. It's a fear that it will end up where he picked it up from: the marketplace. "Death taxes abroad are so high that many families are forced to sell off their inherited collections. Even the library of Sir Kenneth Clark, who headed the National Gallery in London, was sold off because his children couldn't afford to keep it." The Foundation, Alkazi hopes, is the only way to ensure that his life's endeavour won't crumble into anonymity after him. Like all great artists, the collector is rooting for immortality.